Originally announced at CES in January, the new range of televisions include a mix of QLED 4K and 8K-resolution models, with the 2019 QLED 4K line consisting of four series that span in size between 43 inches and 82 inches, while the 2019 QLED 8K line is made up of five televisions ranging from 65 inches to 98 inches. A key addition to the 2019 releases is the ability to access iTunes Movies and TV Shows, marking one of the first instances where Apple has opened up the store to third-party hardware, excluding Windows PCs. Users can view their existing iTunes library and browse the iTunes Store to buy or rent new shows and movies, including 4K HDR movies, with the library and store also said to work seamlessly with Samsung's Smart TV services including the Universal Guide and Bixby. Support for AirPlay 2, Apple's updated media protocol, is also included in the televisions, making it easier for users to play content from their Apple devices on the screens. While the 2019 Smart TV models will have the support for both the iTunes Store and AirPlay 2 built in, 2018 models will also gain the features via a firmware update. The iTunes Movies and TV Shows app will be available in more than 100 countries, while AirPlay 2 support will be available to use in 190 countries. 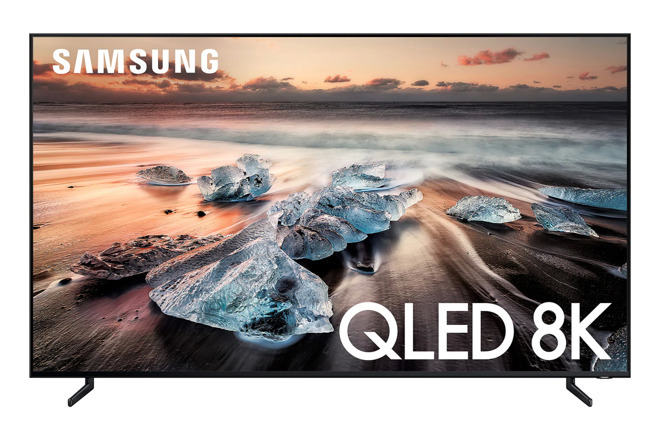 The QLED 4K rage consists of the Q60, Q70, Q80, and Q90 ranges, with both the Q80 and Q90 offering "Ultra Viewing Angle" technology to allow for a vibrant picture regardless of the user's viewing position. The Q70, Q80, and Q90 also feature Direct Full Array technology, which uses concentrated zones of precision-controlled LEDs in the panel, allowing for higher levels of contrast. All models feature a new Universal Guide, which combines content from multiple sources and uses AI to discover a user's favorite content from free and subscription-based sources. An updated Bixby, as well as upcoming support for Amazon Alexa and Google Assistant, will enable users to vocally control their televisions. The accompanying OneRemote adds to the voice command functionality by including a Far Field Voice Capability, allowing it to be used for verbal control even if placed on the other side of the room. New Real Game Enhancer features include support for AMD Radeon Freesync and Game Motion Plus, to minimize tearing, stuttering, motion blur, and judder. An Auto Game Mode is also available to minimize input lag on compatible devices, with AI-based audio and video enhancements optimizing the settings to keep the sound and picture at their optimum during gameplay sessions. Samsung authorized dealer B&H Photo is currently accepting preorders for Samsung's new 2019 QLED TVs. Prices start at $797.99 with free expedited shipping and no tax collected on orders shipped outside these states. Alternatively, shoppers can order select 2019 models from Samsung directly.